And the Soviet head of the jewel commission with careless gesture tosses into its place the "most wonderful and historic stone civilization has known," the diamond that hung before the throne of Akbar the Great, Mogul of Hindustan, under whose mild rule (ending in 1630) India was as well governed as France, Spain, Italy, Germany, or Russia . To Akbar every ruby of price was "the magnificent ruby." To the Communist the most magnificent seems to have become the commonplace. These stones would, heaped together, build such a "cairn of remembrance" as no other collection in the world -- remembrance of glory, of romance, of misery, and of hideous death; for some are such as the Duke of Clarence dreamed of in his imprisonment in the London Tower, all scattered in the slimy bottom of the sea: "Wedges of gold ... heaps of pearl, inestimable stones, unvalued jewels." Some of them lay in dead men's skulls; and in the "holes that eyes did once inhabit" there had crept "reflecting gems." 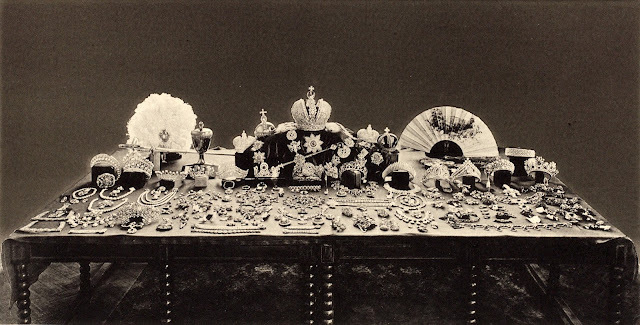 So one cannot look upon these imperial jewels, which the Bolsheviki have guarded so scrupulously, without seeing them all turned to rubies -- not as Akbar's, "to magnificent rubies," but to ensanguined stones. 1. The reign of the Mughal emperor Akbar I (or Akbar the Great) actually ended with his death in 1605. 2. The Times is quoting from Shakespeare here -- specifically, Act 1, Scene 4 of Richard III, where Richard's brother, the Duke of Clarence, tells his jailer at the Tower of London about a vivid dream he had the night before.